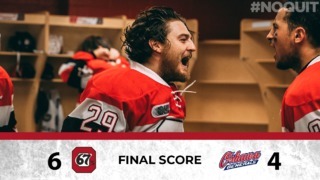 Olivier Lafreniere stopped 41 of 42 shots Saturday night, while Artur Tyanulin scored the overtime game-winner to send the 67’s past the Owen Sound Attack 2-1. 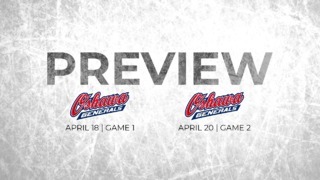 For a second straight night the Ottawa 67’s enjoyed a strong performance between the pipes. Leo Lazarev’s 43-save performance Friday seemed to have inspired Lafreniere who, just like Lazarev 24 hours earlier, stood on his head almost the entire game, lifting his team to a second straight win on this three-game road trip. On the offensive side Tyanulin and Sasha Chmelevski took care of business as both linemates picked up a goal and an assist. Tyanulin, who was playing his 100th OHL game netted the game-winner in overtime, after only a minute of play. The Attack drew first blood, as the home team opened the scoring at the 6:17 mark of the first period when Jonah Gadjovich scored his 4th of the season sending the puck past Lafreniere for the only time of the night. Despite being outshot 13-8 in the opening frame, the 67’s fought back and found a way to tie the game before the end of the period, as Chmelevski netted his 11th of the campaign on a play set-up by Tyanulin and Austen Keating. The second and third period belonged to the goaltenders. Lafreniere stopped all 29 shots that he faced in the last 40 minutes of regulation time, while at the other end, Owen Sound’s netminder Michael McNiven saved the 17 shots that the 67’s sent his way. After 60 minutes, the game was tied at one. The Barber Poles wasted no time ending things in overtime, as Tyanulin capped off his 100th OHL game by giving his team a second straight win with his 8th goal of the season with Chmelevski drawing the assist. 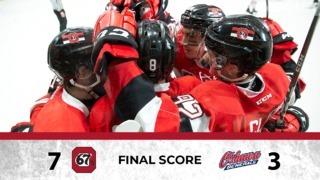 The 67’s will wrap up their three-game road trip on Sunday afternoon when they visit the Mississauga Steelheads at 2 p.m. Ottawa’s next home game is Wednesday morning at 10:30 a.m. when the 67’s host Peterborough in the annual School Day Game at Canadian Tire Centre. Tickets are available for by clicking here, calling 613.232.6767 X1, or in person at The Box Office at TD Place. All minor hockey players part of the 67’s Prospect Program presented by Enercare get in for FREE. For more information on the 67’s Prospect Program click here.